Born in Congo, Agnes Twishime arrived at a refugee camp in Uganda when she was just three. 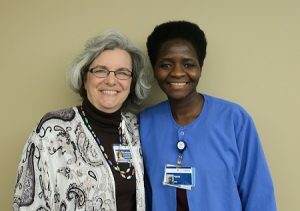 Now with laundry services at Providence Alaska Medical Center, Agnes shares with Mission Services Director Kathleen Hollis, her experience as a child refugee and desire to help care for the vulnerable and those in need. Agnes: I was born in the Congo, but I came when I was little to the refugee camp. Kathleen: So your life was the refugee camp? K: So what was it like, in the refugee camp? A: Really, I liked how they handled us, in the refugee camp, and that was in Uganda. They really cared as they could. K: What would you do in a refugee camp, before you came here? A: Before I came here I was a student. I was in high school. I went to the school that was in the refugee camp for one year, of which was the first year of high school. In all normal days I didn’t live at home. I moved away from the home to study from there because I stayed in boarding schools. And I really gained from it, because it helped me a lot. I knew from women of integrity, I knew whom I am. K: When you came here did you come with the whole family? A: Ah, I didn’t come with the whole family, some of them remained. I have dad, mom and one elder brother. K: Is your family….do they want to see you get this schooling? A: Um, before, they were not interested in educating girls. But nowadays, they came to notice the importance of studies, of education. But now they know any person can help because they have seen girls making it. K: What did you think when you came to Providence? A: It was interesting. The reason why I applied for this job, you may ask me that question! K: Why did you apply for this job? A: Since my childhood I like to work for the community. I liked to work with a group of people. It’s like, I liked caring about the vulnerable, needy? And then I thought “This is the right place.” I dreamed of being a nurse before, when I was still schooling. Unfortunately I didn’t manage to complete my studies, but I hope I will. K: Agnes, here, in Alaska, in Anchorage and at Providence, I really hope that you’ve found your experience to be welcoming. A: I did! And this one has made me believe that even my friends, who are still over there in Africa or in refugee camp, they will make it. Because I didn’t know that I could reach to this step of sitting in a hospital caring for someone that is a patient. I did! I have done it but I didn’t believe it, and I did not believe that I could be here.